Chukar Cherries: A Year-Round Taste Of Summer Washington state is famous for its cherries, but the juicy fruits are available for only a short time each year. Chukar Cherries, based in Prosser, Wash., uses 250,000 pounds of them annually in its dried cherry candies. Fans say Chukar's goodies let the sweet taste of summer last all year. Farm-fresh Rainier cherries get sorted before they're dried for candy and other treats. Over the course of just a few sun-soaked weeks every summer, Chukar Cherries in central Washington state dries 250,000 pounds of fresh cherries. "It's almost like going into your mom's kitchen and she's just taken a cherry pie out of the oven," says co-owner J.T. Montgomery. "A little bit like that." Not surprisingly, the dried fruit goes into lots of Chukar Cherries' products, including the company's most popular: chewy, semi-dried cherries, rolled in oval nuggets of chocolate. Make no mistake: These are not those syrupy chocolate-cherry candies that people hand out on Valentine's Day. 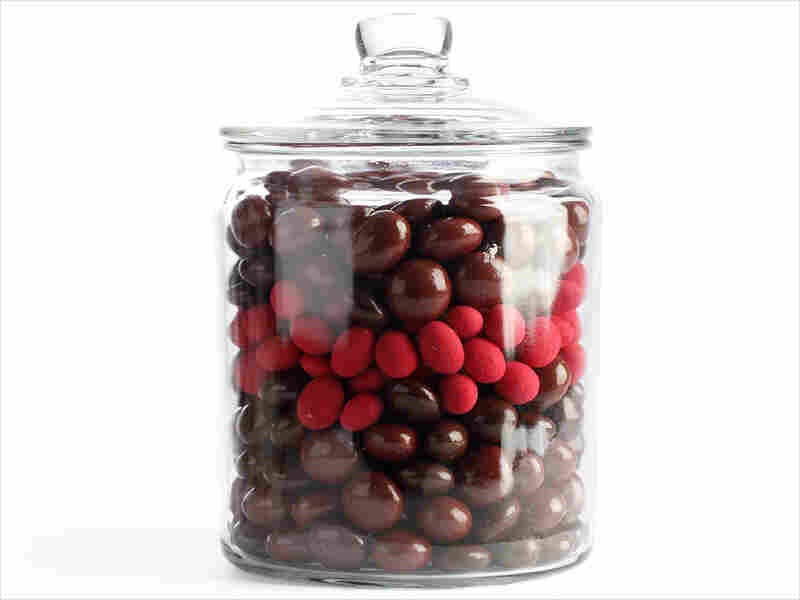 Instead, think chocolate-covered raisins, but much richer. On an early summer morning at the Chukar Cherries facility in Prosser, Wash., Eva Moreno is scraping the dried sticky treats off of stainless steel trays. "No snacking allowed," she says. "Even though they look delicious." Through a set of double doors is the "chocolate room." What look like massive copper kettles turned on their sides spin around like concrete mixers. "The process that you're watching here is called panning," Montgomery says. 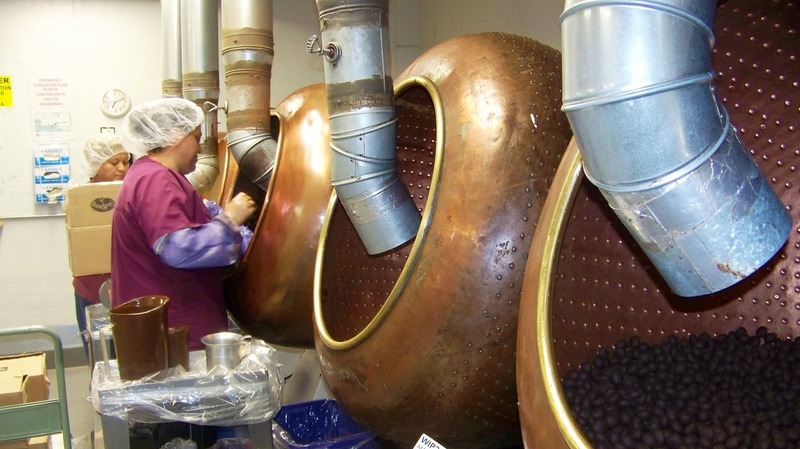 "It's an old-world chocolate process." "Each new layer of chocolate adheres to the previous layer. It just builds up ... exactly like a pearl." You can order these treats online, but you really need to visit Chukar Cherries' tasting room for the full experience. Anita Quinn, a high school teacher and regular Chukar Cherries customer, is perusing the offerings today. A tasting room staffer offers up a sample of Chukar's "Cabernet," a tart cherry covered in dark chocolate. Quinn pops the sample in her mouth. "Ohhhh," she sighs. "Well, how could you beat dark chocolate and a cherry? You have that sweet taste and then it's a little tart. It just goes together." For Quinn, Chukar Cherries capture the taste of central Washington. "I remember my mom could always hardly wait to get cherries from here, the fresh ones," Quinn says. "But then when they started doing this — it's like you can have them all year." That means summer can linger, even in those dark winter months here in the Northwest. A batch of cabernet cherries are evenly coated with chocolate at the Chukar Cherries facility in Prosser, Wash.